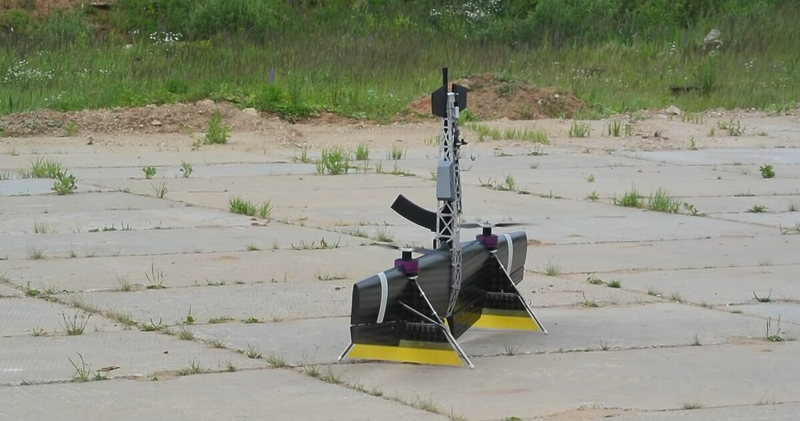 The gun firing the shot is carried in the body of a Russian drone, built for aerial superiority in the lowest skies against the smallest targets. As seen in a new video, this almost comically straightforward concept of a drone built around a gun can, at least in test conditions, shoot other craft out of the sky. The tail-sitting drone, built around the shotgun shell firing Vepr-12 variant of the familiar AK rifle frame, was first designed by students in 2016. On March 12, Russia’s Federal Service for Intellectual Property granted a patent to the design to the Almaz-Antey defense corporation. The impetus behind the drone is to have a fast, on-hand interceptor that can shoot down the smaller, cheap commercial quadcopters and fixed-wing drones used by irregular forces as scouts or weapons. Small arms fire from the ground isn’t the most effective answer, but up close and from another aerial vehicle it might do the trick. After the drone destroys a balloon in the video, it moves on to its next target, a small fixed-wing remote control plane. The target is a hobbyist toy, more commonly associated with model airplane shows than insurgency and airpower. Before the camera can focus, the interceptor fires and knocked the model airplane out of the sky, its inert form spiraling to the ground. It might be best to consider the video a proof of concept. It’s a demo reel under ideal conditions. The complete flight, from tail-sitting launch to balloon popping to drone-downing and landing again, runs about three and a half minutes. What’s not clear is the control scheme -- is the drone being remotely piloted, as is likely, or is it flying an autonomous path? What sensors does it have that enable it to perceive its targets? How quickly can this drone launch and find a target that isn’t already over the airfield, and when gets close, will it have enough ammunition, flight time, and accuracy to do what it needs to do? Much remains unanswered. The account that hosts the intercept video includes two other short clips, each worth examining for separate reasons. The first is more of an oddity, a person firing the gun inside the wingless drone fuselage like a clunky rifle. While it seems like this is a useful adaptation only in desperate circumstances - ones where the drone is already disassembled and no other small arms are at hand - it does provide a closer look at the fuselage itself. Could other weapons be loaded in, make the interceptor not just a flying shotgun but perhaps a flying case for any sort of weapon that can slot into its body? In another video, posted online in March 2018, we see an alternative path for the interceptor design. A sleek body features a smaller rotor in the nose, and contains no visible weapon at all. Drones are mostly platforms adapted to various roles, and having a vertical take-off and landing-ready body could be at least as useful as a scout as it is as a drone interceptor. 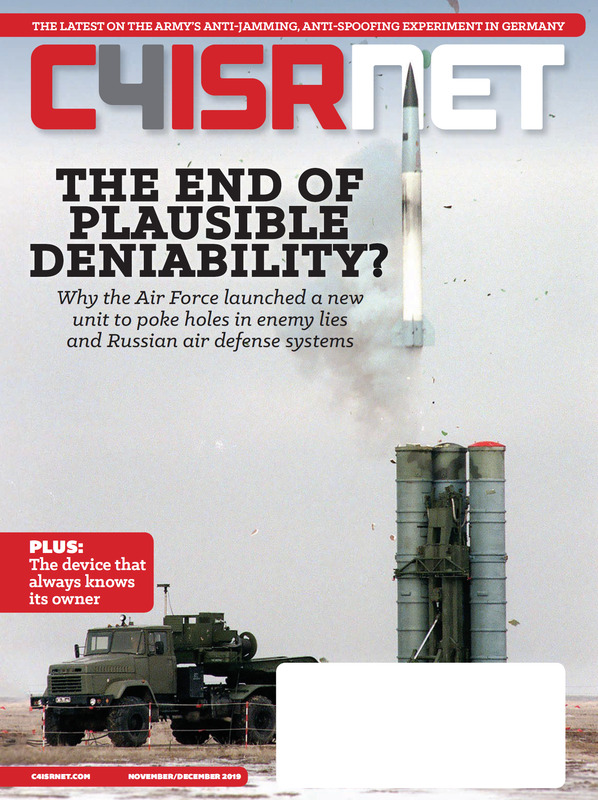 “Russians are increasingly deigning VTOL and tilt-rotor UAVs that would not need extensive logistics- or even limited logistics, like a catapult,” says Samuel Bendett, an adviser at the Center for Naval Analyses.